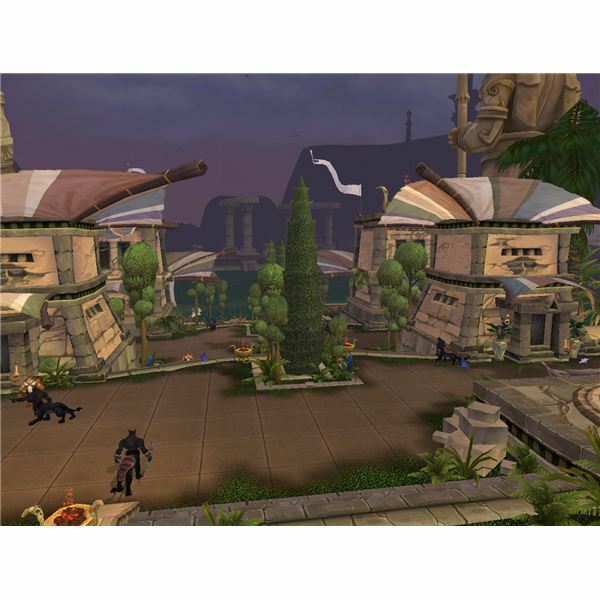 The barrier around Uldum protected the cat-like race of the Ramkahen from the rest of the world. Denziens of Azeroth had long forgotten that there was another civilization behind the barrier. Deathwing's initial assault on the world caused the barriers to fall, and the chief archaeologists of the world found themselves attracted to the still extant society in Uldum. Alliance players begin their part in the quest by seeing Professor Harrison Jones in Stormwind. Mixing genres and metaphors, the good professor gives you a quest about "That's no pyramid." He may also mumble something about how he swears he shot first. The latter part bears no relevance to the reast of Harrison Jones's appearances in World of Warcraft. 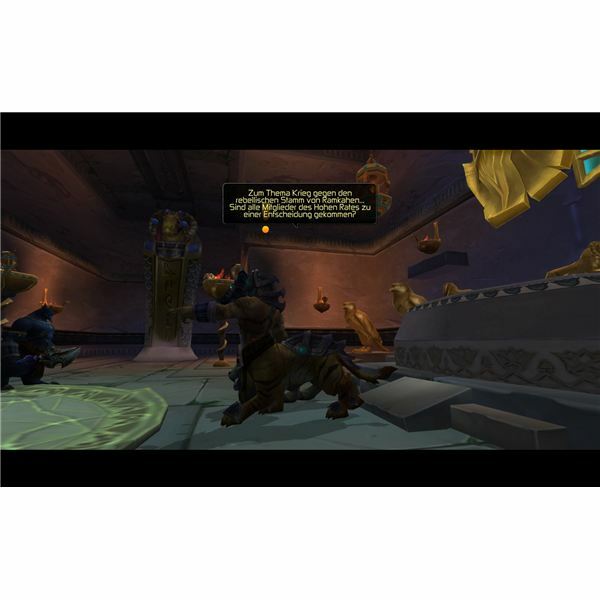 Harrison Jones made his first appearance in a Grizzly Hills quest chain in Wrath of the Lich King. Most of the Cataclysm faction portals open after 5 or 6 quests. Players need to complete 20 quests before they even get to the primary city of the Ramhaken and a few more before the portal actually opens. World of Warcraft developers may have wanted to tell the stories through the quest line, but they could have made this zone a little more convenient. The Hero's Call quest for Uldum becomes available at level 83. Dailies for the faction start when a person earns the friendly faction. As with all the other factions in Cataclysm, a person can buy the tabard from the vendor at friendly. He also gets access to the Daily Quests located in an around the Ramkahen city. The quest lines that involve the faction in the zone earn a person who plays through them an honored reputation. While the Ramkahen gear favors melee characters slightly, a few leather and cloth items will help DPS casters. 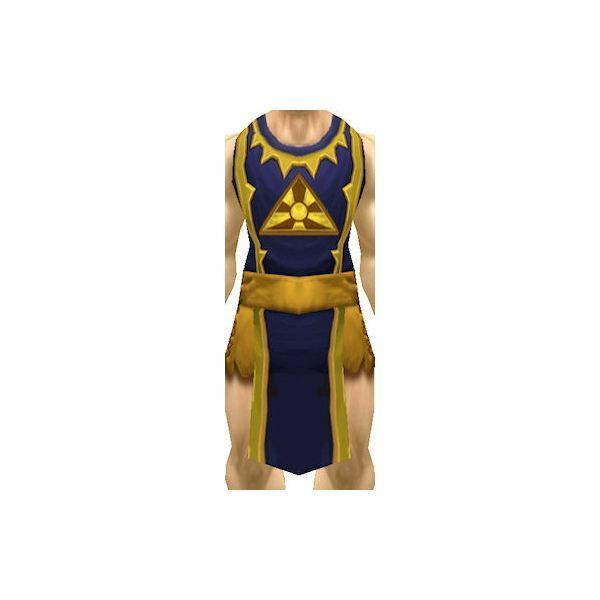 Robes of Orsis, available at 346, help warlocks and mages increase their damage per second ratings and their hit point totals. Shroud of the Dead replaces most melee cloaks available through questing. Acranum of the Revered is a head slot item enchantment designed to help a character's tanking ability. Most players will pay more attention to the mounts available when a character becomes exalted with the faction. Many players only use one or two favored mounts at the time. Purchasing the right camel earns the player the one hump or two achievement. Unfortunately, a player cannot just say "I'll work on this faction for the best gear for me" as he could in Wrath of the Lich King and the Burning Crusade. Blizzard spread the gear out so a player needs to work with all the factions in Cataclysm and get the badges to get ready for raids. The time sink annoys some people and delights other people.